NORWALK, Conn. – There are times when trying to nail down the position of someone running for office is like trying to herd cats. They duck, equivocate and sidestep issues with the finesse of a champion boxer slipping a jab. So how does Norwalk Democratic mayoral candidate Harry Rilling feel about siting a BJ’s Wholesale Club on North Main Avenue? But what of the developer’s traffic study that claims the store will actually improve traffic flow? The inquiry about BJ’s and big box development was included in a list of questions submitted to all four Democrats running for mayor in the Sept. 10 primary. The primary’s winner gets to take on four-term Republican incumbent Richard Moccia in the Nov. 5 general election. Answers from candidates Andy Garfunkel and Vinny Mangiacopra appear elsewhere on this site. Matt Miklave’s responses will appear later this week. Rilling responded, as did Garfunkel and Mangiacopra, that a mix of volunteers is needed. Rilling took it a step further, pointing out the need to make the boards and committees look more like the city population. One question that has come up regularly in our comments section is “What would the candidates have cut from this year’s city budget, and why won’t they be specific?” We asked the candidates to name three things they would have cut, but got no specific answers. Rilling said there is a good reason for that. “The budget process in Norwalk and other cities is very convoluted. The key to innovative budget decisions that actually reduce costs and improved services is to begin work at the start of the budget process rather than just addressing a few dangling items at the end of the process,” he said. Having spent 17 years as Norwalk’s police chief, Rilling has an insider’s view of that process, but retired before this year’s budget was crafted. Rilling did make a few observations about areas that might have been target for reduction. And he wouldn’t stop there, he said. “There are also positions that are earning salaries far in excess of their worth. Some of those positions could possibly be eliminated or consolidated,” he said. Being more specific is problematical for anyone not in on the budget sessions, he said, because the city website does not detail a line-by-line analysis of the budget. “In any event, we must focus on growing the grand list to increase our tax base and remove the undue burden now being faced by our homeowners,” he said. Rilling offered some other cost-cutting ideas he said he would investigate if he is elected. Rilling has indicated in the past that he views Norwalk Economic Opportunities Now (NEON) as a valuable resource for the city that must be helped to right its foundering ship. The agency has been involved in scandals big and small regarding leadership and allegations of financial improprieties, and is currently undergoing a Department of Social Services audit. The agency is already under orders to pay back the federal government for misused grants. A story broke recently that the Norwalk Housing Authority is making a bid to take over the Head Start program that has been run by NEON. NoN asked Rilling about that. Rilling suggested that the entire NEON situation could have been handled better. Moccia cut city funding for the agency when the financial problems were uncovered while Joe Mann was still the president and CEO. Mann has since been removed and a new Board of Directors put in place. Last winter, as candidates were coming forward to pursue the Democratic nomination to run for mayor, Democratic Town Committee Chairwoman Amanda Brown urged her party to be supportive and focus on unseating the incumbent instead of focusing on tearing each other down. Later, she acknowledged that it was obvious it would be a tough primary. And while the candidates have mostly confined their criticisms to more general points, their proxies and supporters have focused on attempting to knock down the opposition. Rilling said that, yes, that is a concern. “This is a major concern of mine as it should be for every Democrat in Norwalk. The four-way primary for mayor is unprecedented, but all the candidates have the right to run and the voters should make the ultimate decision about which candidate deserves to represent and lead the Democratic ticket in the November election. Asked if, should he not be the winner Sept. 10, he would support whoever is the party’s candidate, Rilling did not hesitate. Mr. Rilling’s view of so called box stores is interesting. First since he is still a sitting member of the zoning commission so I would suggest that he either immediately recuse himself from the BJ’s hearing or resign all together because he has naively created an appeal for the developer by his comments. He broke a cardinal rule about discussing publicly a pending zoning hearing. Second, while he is entitled to his opinion about development locally I would suggest that he take a crash course on urban land economics so he better understand how market decisions are made with respect to both supply and demand for commercial and residential real estate. Perhaps once he does that he can have an intelligent debate about real development opportunities. It is easy to complain from a talking points memo it’s another thing to actually know what you are talking about. .
First let me say that site has been one of Norwalk`s eye sores for many years. Second everyone complained when the state wanted to build the Rt 7 connector saying that it would take away all the traffic and adversely affect our business now your saying no because too much traffic,noise, light, but if they found another place then that would be okay. Let me ask just what would everyone like to see there? I think it`s a great place for BJ`s, there is already plenty of traffic,noise,pollution on the other side of town I think we should have a balance don`t you? All the things your complaining about for BJ I did the same about Lowe`s but that project got pushed through so I say spread the development all over the city not just on one side. Mr. Rilling has recused himself from the BJ’s hearing long ago. Remember he is a candidate for Mayor so he has to answer these questions. If he does not, people like you will say “why is he avoiding the question”. In any event, speaking of supply and demand, BJ’s does not have many options when it comes to opening a store in lower Fairfield County. Why doesn’t Norwalk make BJ’s jump through some hoops rather than give the store away so to speak. If they want to open a store in Norwalk they should find an area that is suitable. The site they are planning on is not. Just look at what a little Dunkin Donuts did to that area of Main Ave. and imagine what a BJ’s will do. Wow Mr. Raymond. So your approach in life is if you make a bad decision, don’t learn from it, spread it around? Is the creation of low-paying jobs worse than no jobs being created? Especialy given that these are unskilled jobs. ObamaCare, and yes, I know it is the Affordable Care Act, will result in more part time jobs being created at the loss of full time jobs. I’ll bet most people against a Big Box Store of any kind, not just because of traffic, are almost certainly in favor of a healthcare bill that will result in more and more full-time jobs being replaced by part-time jobs and healthcare benefits for all workers either being cut or driven up in price. So while its cute to say BJ’s will create only low-paying jobs, there are a lot of things that are helping to create those. At least BJ’s is creating a job to begin with. It’s not the job of a zoning commissioner to comment on the merits of a pending application in public. That goes for ALL commissioners. It’s not the job of a zoning commissioner to determine the merits of a pending application based upon anything other than the zoning regs. There’s nothing in the zoning regs that authorizes a commissioner to deny an application based upon employee pay scales. It should not be the job of a mayor to chase jobs or development out of Norwalk. If this is Rilling’s attitude he is eminently unqualified to be mayor. Joe Espo: You should learn to read the answers more thoroughly. Rilling did not suggest chasing jobs out of Norwalk. He in fact is suggesting bringing in more jobs that pay better wages and benefits. That being what he refers to as “mixed Use Development”. Not only will those developments bring jobs to the trades, they will create retail space for which the owners will need to hire workers. That is anything but chasing jobs away. And if you go back into the poll archives of the Hour, you will find the overwheming majority of people participating did not want more big box stores as they have had enough. Mixed use development is code that people use to describe what they think will bring high paying jobs and higher personal and property taxes but have no idea what it is or entails. While Merritt 7 is a great testimony to a bygone era it represents a bygone era. Do you think there will be new offices space built in Norwalk anytime soon or Industrial? In fact mixed use today is retail and Multifamily residential. The last time I drove around town that was happening in droves. As I said earlier folks like Mr. Rilling need to take a crash course on urban land economics before they comment on things they know nothing about. Of course it sounds good and it is the silly season. 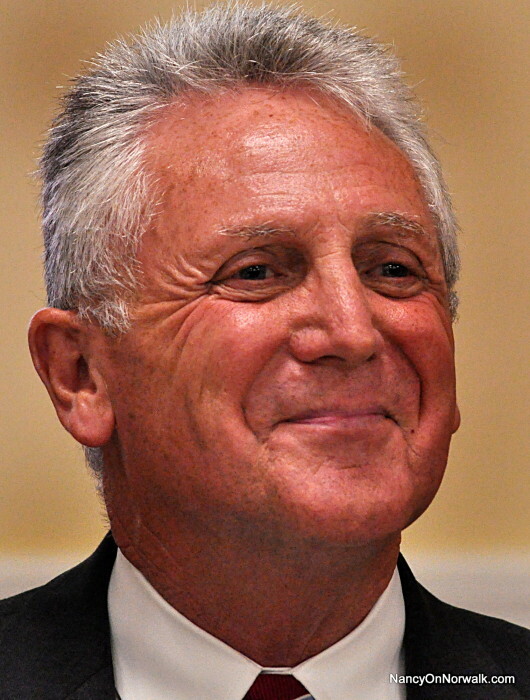 Just a point of information: Rilling had already recused himself from taking part in BJ’s deliberations and decisions on advice of Corporation Counsel after writing an op-ed piece making public his feelings. Click here to see the story. Diversity in city departments too please Harry!! Editor’s note: We ran a video several weeks back in which the candidates addressed this. Click here to watch it. To those that are saying that retail brings only low paying part time jobs you are simply incorrect. Retail does bring some entry level jobs however keep in mind that some people are only qualified to do this type of work. Would you rather see them unemployed?? What type of jobs does a vacant lot bring? Also retail brings in good paying jobs many members of management in retail make 6 figure, so please stop with the false statements about the type of jobs retail creates. CANT WAIT FOR OPENING DAY. Rilling is from a bygone era. He was a disaster as police consultant and would be a disaster as mayor. I have listed Rillings negative points many time . I however have yet to see any specifics from the Rilling political operatives of his positive points.